The WallStreet PowerBook G3 Series was a trio of very capable models replacing the 250 MHz Kanga PowerBook G3 (Apple needs to do something about these names!). The 250 MHz and 292 MHz models were lightning fast, but the 233 MHz version was dog slow. Why? Because Apple decided to keep the price down by eliminating one seemingly small item that makes a world of difference on G3 Macs – the Level 2 (L2) cache. Under MacBench 4, the 250 MHz model demonstrates nearly twice the performance of the 233 MHz MainStreet! 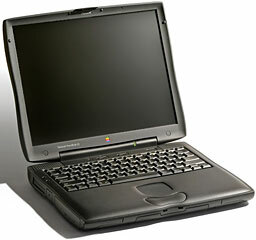 In the second edition of the PowerBook G3 Series, Apple included a 233 MHz model with a 512 KB L2 cache – that made a world of difference. That 233 MHz PowerBook benchmarked 70% faster than the cacheless version. Seventy percent! It’s a real shame that any G3 system should earn a Road Apple rating. Combining the cacheless 233 MHz G3 MainStreet with the 13.3″ display is something you just don’t want to do.